All too often in life, people go out of their way to do kind deeds and never get their due diligence, but Arts for Lawrence is working hard to change that. 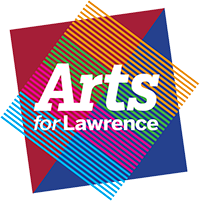 On September 6th, Arts for Lawrence celebrated their volunteers with their Inaugural Volunteer Information Meeting and Reception. All current and prospective volunteers were invited through social media, web and a story done by WRTV 6. Patrons arrived to a festively decorated stage at the Theater at the Fort filled with delicious desserts, compliments of Porter Books and Bread, and a pleasant pourer, Arni Lewin from Elite Beverage with a variety of complimentary wines. To start the meeting, Volunteer Coordinator, Lecia Floyd took the time to recognize several of our most dedicated volunteers by giving them a certificate of appreciation. Among those recognized and honored were the Arts for Lawrence Board of Directors, Volunteers from the Village of Merici and volunteers who have given more than 50 hours of service, this calendar year alone. To end the recognition, Lecia honored three special volunteers who gave over 100 hours of service last year, and are well on their way to volunteering over 100 hours again this year. Dianna Miller, Karen Jensen, and DuWayne Herman were all recognized with a certificate of appreciation and a lapel pin that included the Arts for Lawrence logo and “100+”. We are so appreciative of their dedication to our organization. Dianna and Karen both help with administrative needs on a weekly basis and Karen heads up our Events Committee. DuWayne is our hands-on volunteer that helps with building maintenance and is part of our Theater Committee. DuWayne worked several hours on our backstage to help get it to the nice state it is now. Arts for Lawrence’s Office Manager, Helen Lee shared with the audience about our new membership program which includes a volunteer membership. All of our volunteer members were given their embroidered polos at the meeting as well, as a benefit of their membership. After the recognition was done, we shared with the audience the many volunteer opportunities we have to offer. There are four categories where we could use extra hands - Theater Volunteers, Administrative Volunteers, Building Volunteers and Committee Volunteers. All attendees were given a volunteer application that gave more detailed information of each category. We were so excited to be able to able to host this meeting and look forward to it being a bi-annual event. Our next volunteer celebration will be held in February or March of 2018, and at that time we will recognize our Volunteer of the Year. Will it, be you? !